April is National Volunteer Month so we would like to take a minute to thank all of the wonderful volunteers that share their time and talent with us! Week in and week out, you’ll find these kind individuals and groups around our building, working together to ensure that our neighbors have the resources they need to stay healthy and hunger-free. Last year, 1827 volunteers donated over 6,500 hours to CUMAC! With their support, our team was able to serve over 50,000 of our neighbors in need and distribute over 1.5 million meals. Talk about impact! 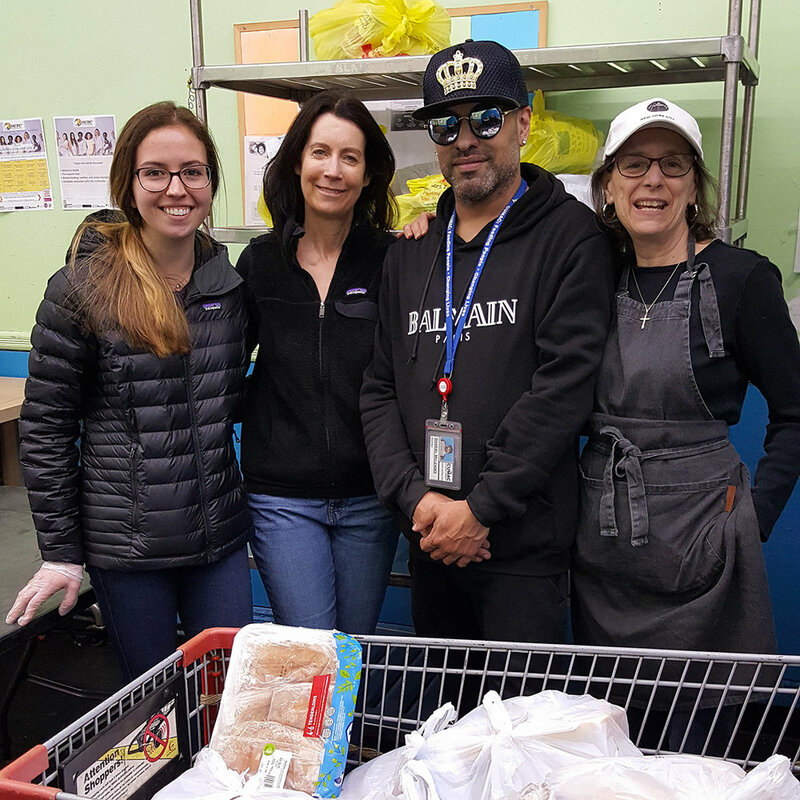 Whether our volunteers are packing bags of hygiene products or sorting through fresh produce, their hard work and dedication never fails to amaze us. "I have been inspired by Andrea, the CUMAC team, and all the people that walk through the door on a daily basis. I volunteer to be part of a community that strives to improve the lives of others." To all of our volunteers, new and old, thank you for feeding people & changing lives with us. Your impact shows what is possible when we work together! Want to help make a difference? National Volunteer Month is a perfect time to get involved! Our team is looking for volunteers to help in our warehouse on weekdays, especially in the mornings. If you’d like to get involved please call (973-742-5518) or e-mail our Program Coordinator, Akeeera Weathers. Can’t get to CUMAC during the week? Join our race team! Team CUMAC will be running/walking in a special event on June 8th called The Yum Run. Call or e-mail us to learn more. 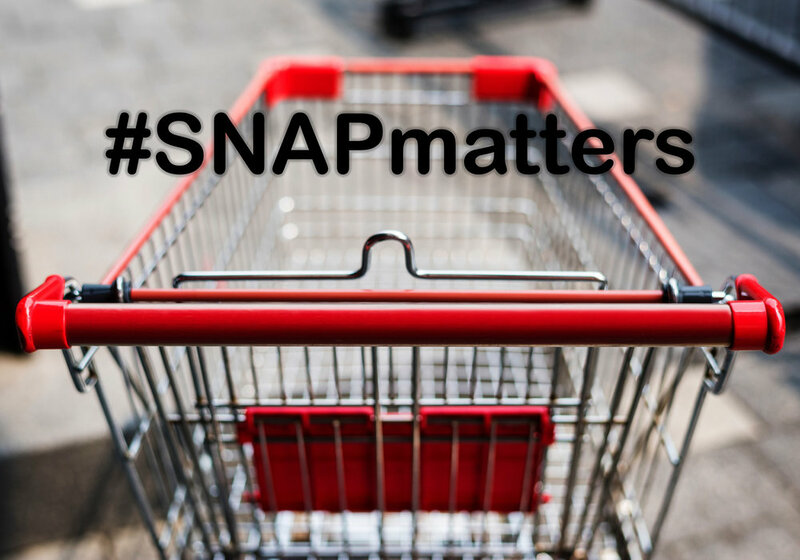 The Supplemental Nutrition Assistance Program (SNAP) is one of our nation's greatest tools in the fight against hunger. The program provides nutrition assistance to millions of low-income individuals and families who are struggling to keep food on the table. The administration recently proposed a rule that would take away SNAP eligibility for 755,000 unemployed and underemployed adults, cutting benefits by $15 billion over the next decade. With 1 in 8 Americans already struggling with food insecurity, these cuts would be devastating, and would leave hundreds of thousands of additional people at-risk of going hungry. Do you have a minute to help? Leave a comment today to protect this vital program. The 60-day public comment period on the proposed rule ends on April 2, 2019. Submit your comment here. Thank you for fighting hunger with us! As the government shutdown continues, thousands of furloughed federal workers and their families are wondering where their next meal will come from. If you or someone you know is being affected by the shutdown, please know that we’re here to assist you. Just bring your federal ID to CUMAC’s pantry and our team will provide food and other essentials. Our pantry is open Mondays from 11am-2pm and Tuesday-Friday from 12:30pm-3:00pm. Fruits and vegetables are also available, Tuesday-Friday from 9:00am-11:30am. Please help spread the word! Questions? 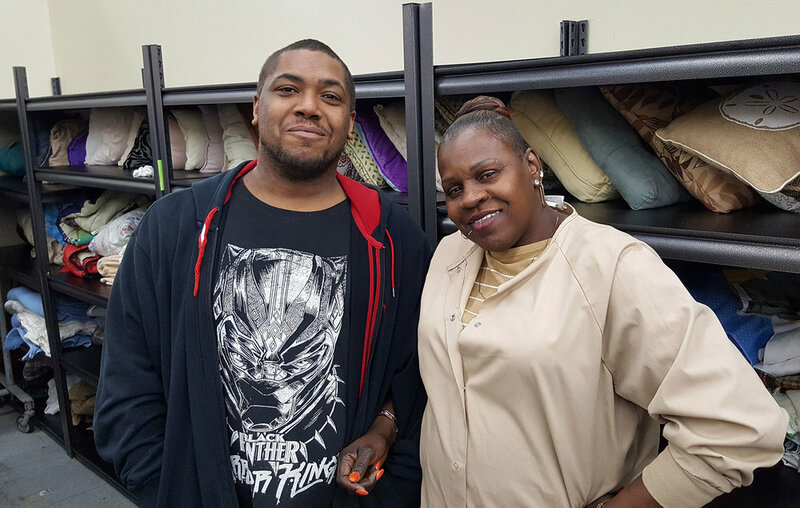 Please contact our pantry supervisor, Shanee Alston, at 973-742-5518 or salston@cumacecho.org. In the early hours of a cool November morning, a fire breaks out at an apartment building here in Paterson. The blaze, which consumes two apartments and destroys several others by smoke and water, leaves 21 residents displaced. A young couple from that apartment building walk through our doors. Hours earlier, this couple and their two small children lost their home and everything they own. They are in shock and afraid. They're staying with some family for now, but they are in major need of support. Our team jumps into action. We gather food, clothing, hats, scarves and coats, as well as pillows, bedding, kitchenware, and other essentials. For our new friends, these donations bring much-needed relief, and hope for a better tomorrow. While nothing can undo the damage of losing one's home, this family will have the support they need to stay hunger-free and start their recovery. Your support makes it possible. Thank you for helping us serve our neighbors when they need it most! Every year, thousands of families face disaster and struggle to get back on their feet. CUMAC is here to help. Consider donating new or gently used clothing, household items, and/or small furniture to our Community Closet. Call (973-742-5518) or e-mail our office to learn more about our disaster relief program. For more ways you can support our work visit our donation page. This holiday season CUMAC is partnering with the Toy Foundation (TTF) to provide toys to hundreds of kids in need in Passaic County. 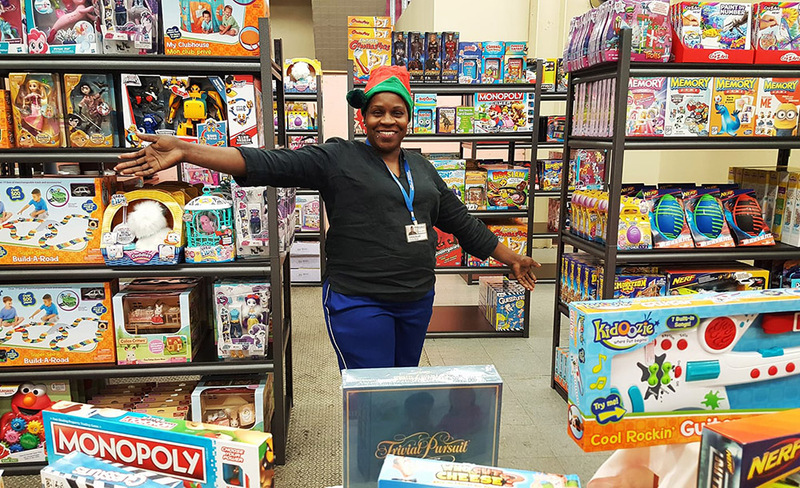 The toy giveaway will be a part of CUMAC’s inaugural Holly Jolly Holiday Party, a community event taking place on December 14 and 15 at the organization's facility in Paterson, New Jersey. Several of CUMAC's community partners will gather to take part in the celebration, which is by invitation only. The agencies will bring the children they serve, ranging in age from 3 to 14, for a day full of fun and excitement. The Toy Foundation will be providing more than 1,000 toys for this event, including board games, plush, puzzles, ride-ons and much more. 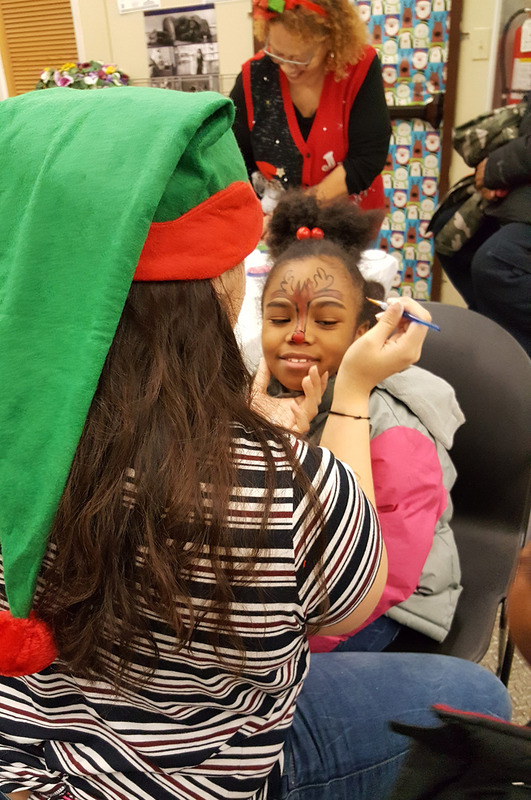 Along with choosing a favorite toy, youth in attendance will enjoy festive snacks and activities, including photos with Santa, arts & crafts, a winter clothing giveaway, and some fun surprises. “More than providing toys, it's important to provide children with rich experiences that they're able to remember for years to come” says Mark Dinglasan, CUMAC Executive Director. To learn more about the event or how you can get involved please call 973-742-5518 or e-mail our team. CUMAC provides a range of services for community members struggling with hunger and poverty. CUMAC’s programs include a food pantry that serves over 2,500 people monthly; a food depot that handles over 1.4 million pounds of food and other resources for a network of over 30 agencies; a disaster relief program; a thrift shop that provides high quality, low cost items to the community; the Pathways to Work program that offers job training to those seeking gainful employment; Place of Promise which provides a permanent supportive housing program for the chronically homeless; seasonal projects that gives school supplies and other items to thousands of children in need; and the Community Food Coalition, a collection of pantries working together to stop hunger in New Jersey. Thanksgiving is around the corner and for many of us that means loved ones, laughter, and plenty of delicious food. Unfortunately, for many of our neighbors, Thanksgiving can be a time full of stress and fear. According to a recent study, 1.2 million New Jersey households are struggling to meet their basic needs. In other words, more than one third of our neighbors have trouble affording essentials like food, housing, and healthcare. As you can imagine, during the holiday season, it only gets more challenging for families living on a tight budget. Many of our neighbors are forced to make hard decisions to make ends meet, and that can often impact their health and well-being. Fortunately, our neighbors don’t need to face their struggles alone. CUMAC's food pantry provides groceries to more than 2,500 low-income and food insecure individuals per month. Our daily distribution of produce and fresh items reach an additional 4,000 people monthly, which means we’re helping keep our neighbors hunger-free and healthy. With the holidays fast approaching, we expect to serve even more clients in the weeks ahead. As you reflect on your blessings this season, we ask you to please remember those who may be less fortunate. Our team will be working hard to ensure that everyone who walks through our doors this month gets the support they need and we hope you’ll join us. What better way to show your gratitude this season than through an act of kindness? Consider giving back this month by making a donation, volunteering your time, or holding a food drive. Together we can ensure that every family in our community has a Thanksgiving to remember! Thank you for making our work possible. This Thanksgiving, we’re grateful for supporters like you. This year CUMAC has been taking steps to ensure that we’re doing everything in our power to keep our neighbors healthy and hunger-free. As part of this process, and for the first time, our staff held focus group sessions with our clients this summer. The sessions, which were hold over the course of several weeks, provided some valuable insight, allowing our team to better understand the needs of our community and the challenges our clients face. The focus groups also resulted in some great suggestions about our pantry process. With this feedback in mind, our team is already taking steps to bolster our grocery bags, adding items that our clients find most helpful. We’re also improving our pantry layout to streamline our food distribution process. Overall feedback was positive from the sessions, and many of our clients stated that our pantry allows them to eat healthy on a regular basis, something that is greatly appreciated. Along with changes in our pantry process, our team is using feedback from our focus groups in other ways. With the help of our community partners, we’re continuing to create more opportunities to educate and empower our clients throughout the year. Recently, CUMAC teamed up with Summit Medical Group Foundation to provide free health screenings in our pantry. We had our first health screening day this month and it was a huge success! Clients and community members had the chance to visit our pantry to have glucose levels, BMI, and blood pressure checked for free. For many of those in attendance, it was the first time they had received a screening in years. In the coming months we’ll be working with Summit Medical to hold more screenings and health initiatives. Another way CUMAC is utilizing client feedback and encouraging healthier living is through fresh food available in our pantry. As you already know, CUMAC gives out fresh fruits and vegetables every day. But thanks to our amazing partners, we’re providing more produce than ever, giving our clients the opportunity to have a healthier, balanced diet throughout the month, regardless of their income or location. 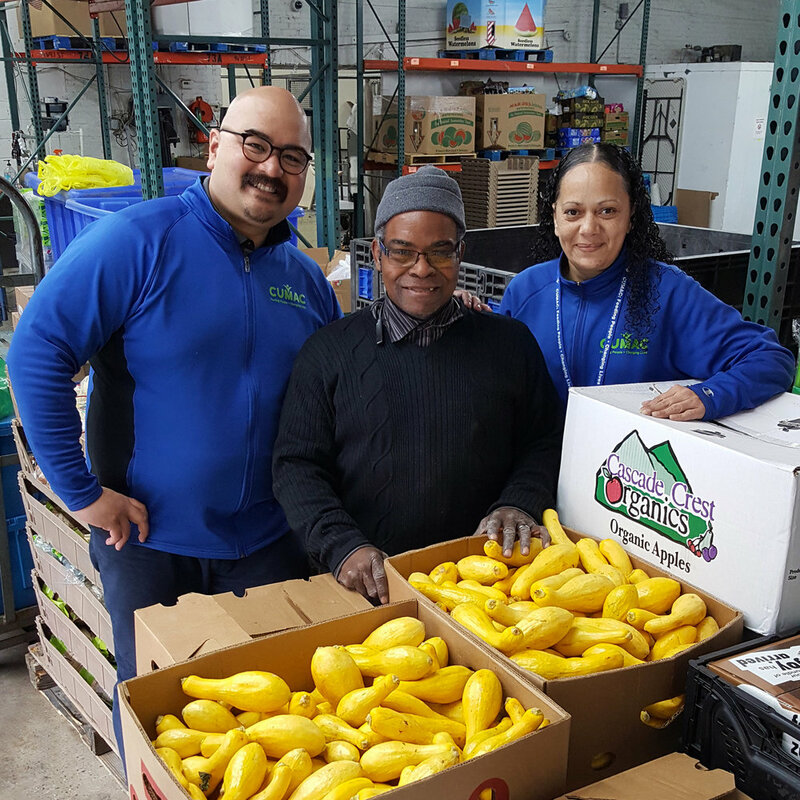 To take this a step further, CUMAC is partnering with ShopRite of Passaic and Passaic County Community College to show our clients different ways they can use the produce shared in our pantry. Through simple recipes and cooking demonstrations featuring these items, clients are learning more about everything we serve. 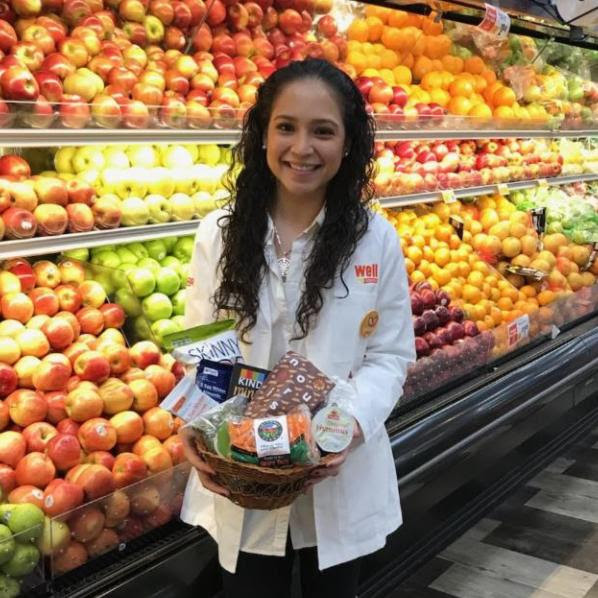 Just the other day, resident Shop Rite dietitian, Andrea Reina, made fresh pico de gallo with our clients to give them a simple way to use the large haul of tomatoes and peppers that were recently donated. Working with these groups has been a wonderful experience so far and we’re thrilled to see that it’s breaking down barriers and making our clients more comfortable trying new types of fresh food. With an ever-changing lineup of produce in our pantry, it’s wonderful to have partners that can make recommendations and share their expertise. As we continue to serve our community in new and exciting ways, friends like you make it all possible. Thank you for helping us feed people & change lives. Together we’re building a healthier community for all. Through a generous grant from the Columbia Bank Foundation, we recently renovated our warehouse floors and gave CUMAC a much-needed makeover. 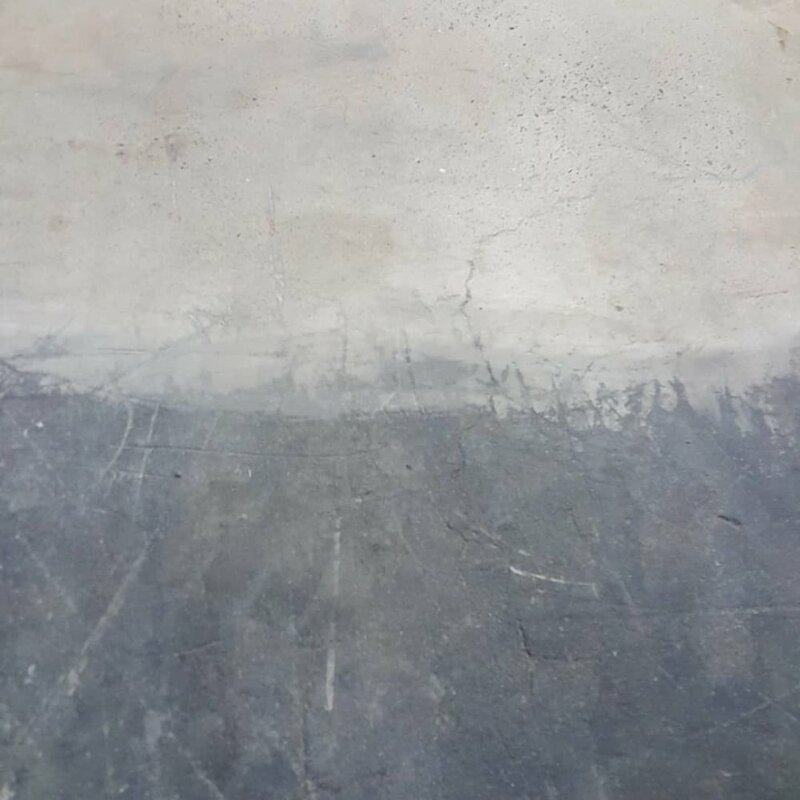 Scroll through the gallery below to see the transformation. What a difference! Our building is looking better than ever and our staff couldn’t be more excited. Thank you to Columbia Bank for making it possible! According to the Kids Count 2018 Report, Passaic County has the highest rate (28%) of child poverty in the state. NJTV stopped by CUMAC recently to see how we are tackling this issue in our community. Watch the video above or see the full story here. CUMAC is teaming up with our friends at Passaic County Community College's Food Service Training program! Led by Chef Robert Ekert, the PCCC team has been visiting CUMAC to teach our clients about cooking and food safety through regular food demos in our pantry. 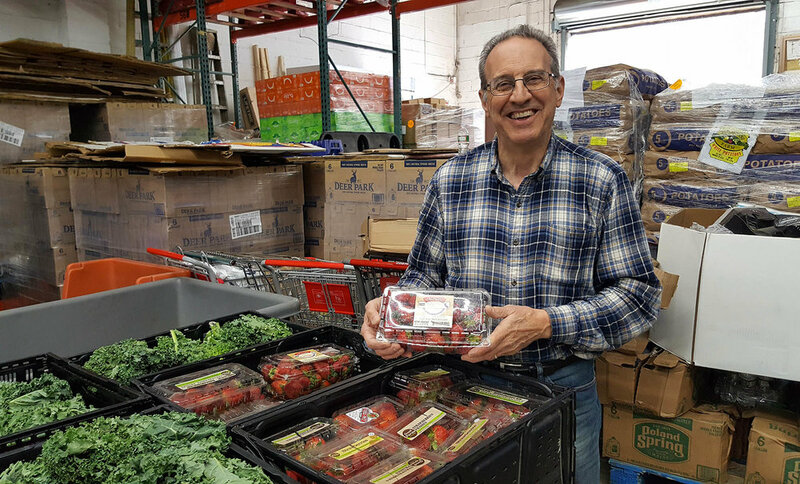 Recently, our clients have learned exciting new ways to use different types of produce and other rescued items that are given out daily in our pantry. Chef Robert even taught a class about what can be done with leftover bread! To everyone’s enjoyment, our clients learned how to make bread crumbs, croutons, pizza bread, bruschetta, and much more. Not only did this provide great dinner recipes, it was also a valuable lesson in how to reduce food waste. Along with sampling different foods, clients have received valuable lessons in food safety and knife skills through our food demos. PCCC will first teach a lesson, then do demonstrations for all to see. After each demonstration, clients have the opportunity to ask questions about the lesson and other topics. For clients and staff alike, having the opportunity to ask professionals about food has truly been an enlightening experience. It’s no surprise that the food demos, educational and delicious, have been a huge hit in our pantry. As CUMAC continues to grow, our staff will be providing more learning opportunities like this for our clients. We hope that these demos will encourage our clients to work on their cooking skills, experiment with different foods, and make the most of the items they receive in the pantry. We’d like to send a big thank you to Chef Robert and our friends at PCCC for sharing their knowledge and passion with us. We look forward to more food demos in the months ahead! 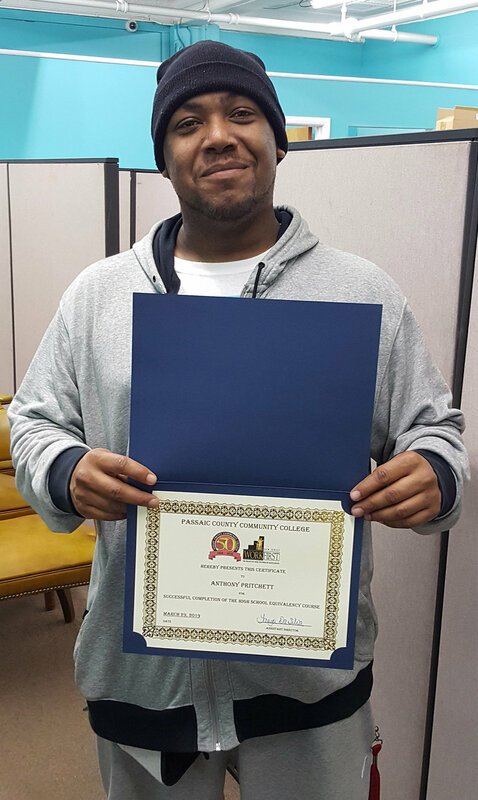 To learn more about PCCC's program please call Jim Hornes, Director of Food Service Training, at 973-684-5757. It's National Volunteer Week and we'd like to take a minute to thank all the incredible volunteers that help make our work possible every day! At CUMAC and across the country, volunteers are committed to making a difference in their communities and we are constantly being inspired by their actions. 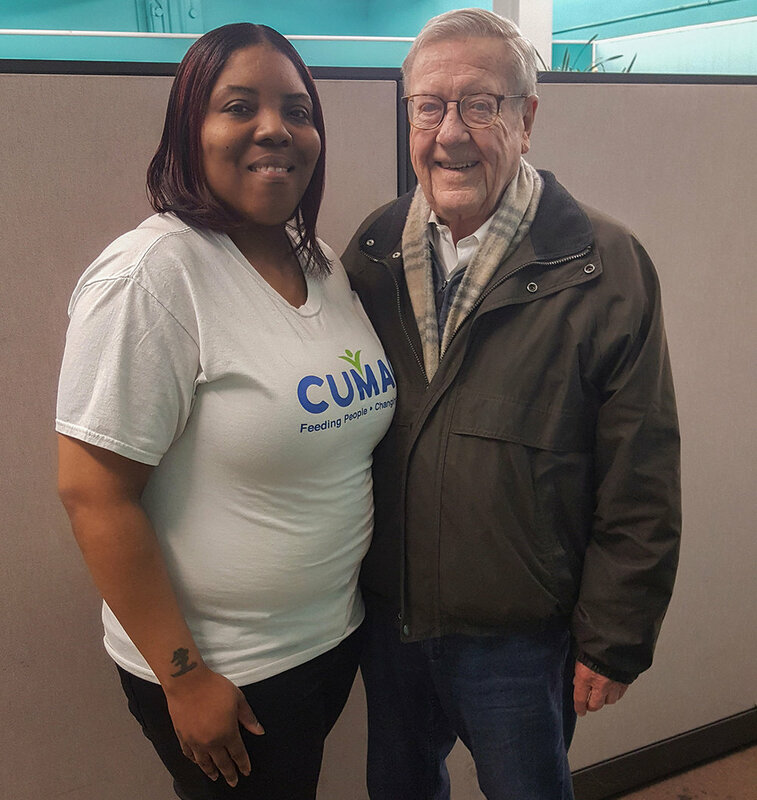 "CUMAC is a really great organization that serves people with as much care as they treat their team members and coworkers. It was great being shown the facility on my first day of volunteering and being assigned a leader to shadow and help with stocking the pantry, creating food bundles, or any needs they had. Everyone greets you with a smile, they provide opportunities for part-time workers to get work experience and they host creative and effective fundraisers with the broader community of partners and interested individuals to serve the Paterson community. I am grateful to have the opportunity to serve with them." "We love volunteering at CUMAC! Annually I organize a volunteer trip for a group of teenagers and adults from the United Methodist Church of Summit where I serve as Director of Christian Education. We are always impressed by the incredible work CUMAC does to help our neighbors in need. We have helped sort food, catalog thrift shop donations, sort shoes, and assist with mailings. We also bring a collection of food to donate when we come. Our day at CUMAC is always a fun and meaningful volunteer experience. We leave feeling proud and grateful for all CUMAC offers and for the opportunity to participate in these wonderful ministries . Thank you CUMAC!" “I have a passion for giving back to the community and CUMAC has provided me with the opportunity to help others who need assistance and service. The managment, staff, and volunteers are all wonderful to work with, and the teamwork and positive attitude in the building makes it a great working environment." "CUMAC has brought a lot of change into my life and I got a great experience from helping others as a volunteer. I love CUMAC because it has brought so much awareness to me about the issue of hunger. I had the chance to fundraise for a 5K, volunteer in the pantry, and donate food to families in need thanks to the incredible platform this nonprofit provides." "Since finding CUMAC, I feel that I am a small part of a family — helping other families less fortunate." 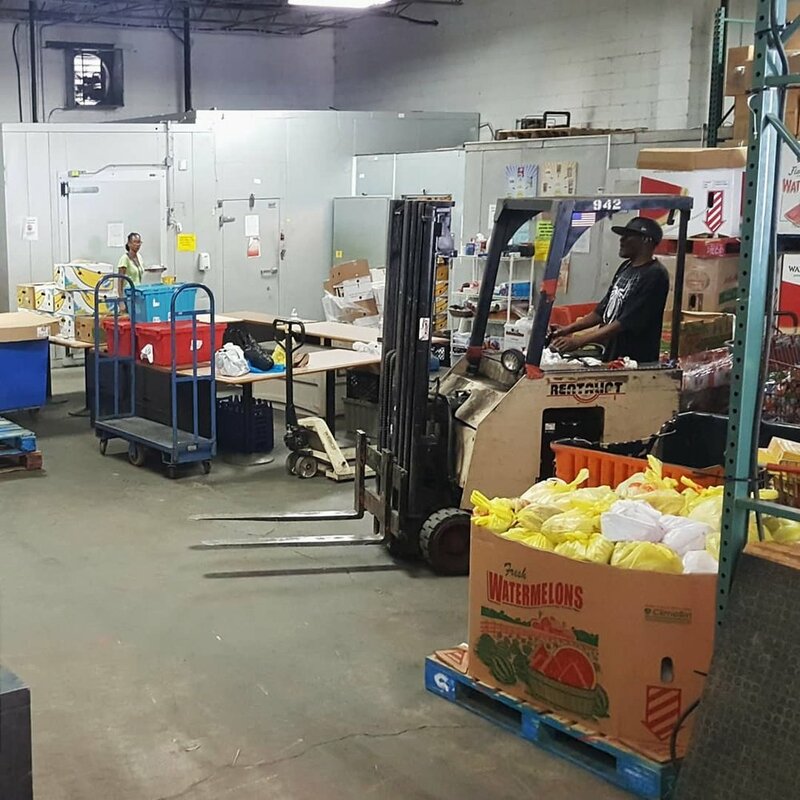 "I love that CUMAC is open to anyone and everyone volunteering at their warehouse to help alleviate hunger around the Paterson, Passaic County, and northern New Jersey areas! I started volunteering at CUMAC alongside the Montclair State Dietetics Organization back in 2013 and have loved it ever since. My passion for nutrition greatly flourished from volunteering here due to the community aspect and knowing that families who need proper nutrition and education will be able to get it with the help from CUMAC. My fondest memory with CUMAC is being able to lead the Action Against Hunger food drive with the help of MSDO members! I am grateful that CUMAC and their wonderful team is part of the backbone in my passion for becoming a registered dietitian nutritionist." "It wasn't until I came here with my church that I really got to experience what a great operation this is, the wonderful people, and all the incredible things they do -- not just for Paterson, but around the area. I was working at the time and I decided that when I retired this is what I wanted to do, this is kind of what I wanted to grow up to be. I wanted to be a CUMAC volunteer. They do wonderful things with wonderful people and it's amazing to see how many lives they touch." Whether you volunteer once a week or once a year, your time makes a difference. Thanks to all the volunteers, old and new, who are fighting hunger with us. Our work wouldn't be possible without you! Want to help CUMAC feed people & change lives? Call (973-742-5518) our office or check out our volunteer page. 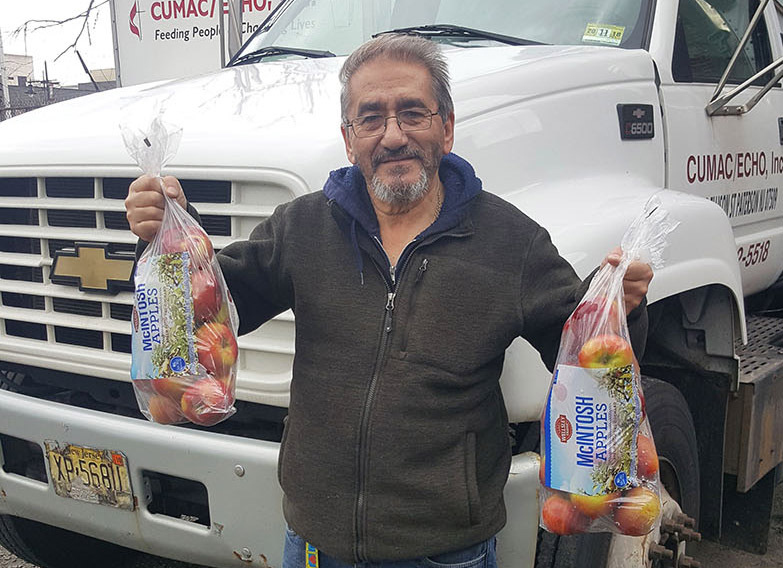 bert, cumac's senior driver, holding fresh produce from his morning pick up. Last year CUMAC provided 35,000 people with food through our food rescue efforts alone. This year we hope to reach even more people. We’d like to thank all of our supporters for making it possible. When you donate to CUMAC, you help fuel our trucks, you power our refrigerators, and you help ensure that thousands of families around our community have the ability to provide fresh, nutritious meals. Together, we’re creating a happier, healthier community. Thank you for making it possible! This story originally appeared in CUMAC's winter newsletter. To read more click here. It was a close competition, but we're excited to share that Team Green is the winner of CUMAC's Souper Bowl Challenge! 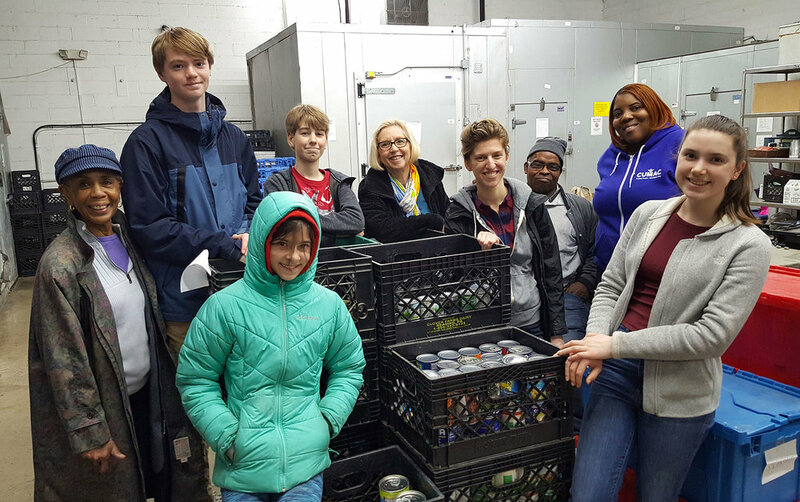 Several groups participated in this year's competition, and together they collected over 3,000 pounds of food and hundreds of dollars for CUMAC in just 3 weeks! The best part about the Souper Bowl? There are no losers! All collections, large or small, will help feed families in need this season and that is something we can all celebrate. We’d like to send a special thank you to Midland Park United Methodist Church, Charles Olbon School, Delta Phi Epsilon at William Paterson University, EOF Rising Leaders at Brookdale Community College, Union Congregational Church, Maxell, and everyone who helped tackle hunger with us! 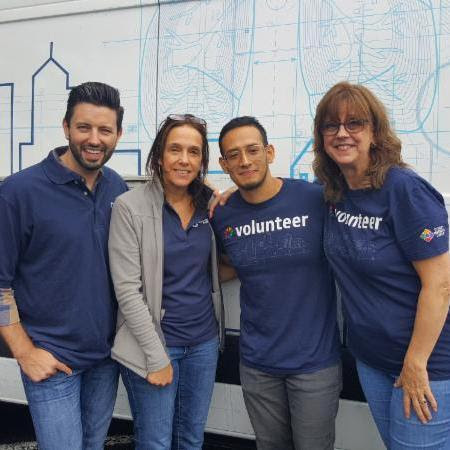 With nearly 1 million people struggling with food insecurity in New Jersey, our team realized a long time ago that we can’t stop hunger alone. Under CUMAC's leadership, the Community Food Coalition(CFC), a collection of nearly 20 pantries and agencies around the area, have been working together to fight hunger in our community. CFC agencies meet every other month to discuss needs, issues, and ways we can collaborate. Through teamwork and communication, we're excited to share that the CFC is making great strides. In the early hours of a warm summer morning, Eddie wakes to the sounds of panic. There is screaming, then banging on the door. “It’s a fire! It’s a fire!” a voice yells. Eddie jumps out of bed and opens the door. The smell of smoke fills his apartment immediately and he sees people running down the stairs. Fear sets in and he hurries for dear life. Luckily, he escapes the building, along with the rest of his neighbors, but his home is completely destroyed, along with all of his belongings. With only the clothes on his back and with nowhere to go, Eddie ends up at a local shelter. While the fire lasted a few short hours, the aftermath is long and stressful for Eddie. He is homeless for over two months. It’s a difficult time for him, but he stays optimistic and hopes for the best. Eddie has been a Paterson resident for years. He is also disabled and living on a fixed income. Being on a tight budget every month, the fire left him struggling financially. Weeks after finally finding an apartment, he was still living out of a suitcase, unable to afford the extra expenses that come in the wake of the fire. Fortunately, Eddie learns about CUMAC from a friend and decides to visit. He is pleasantly surprised when he arrives, greeted with big smiles and plenty of support. Eddie receives bags full of groceries from our pantry, as well as clothing, hygiene products, household items, and more from our Community Closet. For Eddie, these resources are a huge relief, giving him the boost he needs to get back on his feet. Since then, Eddie has been slowly furnishing his new place. “It’s finally starting to feel like home” he tells us. He’s not able to cook at the apartment, since he doesn’t have a stove, so he loves being able to visit CUMAC for bags of food that are ready to eat. 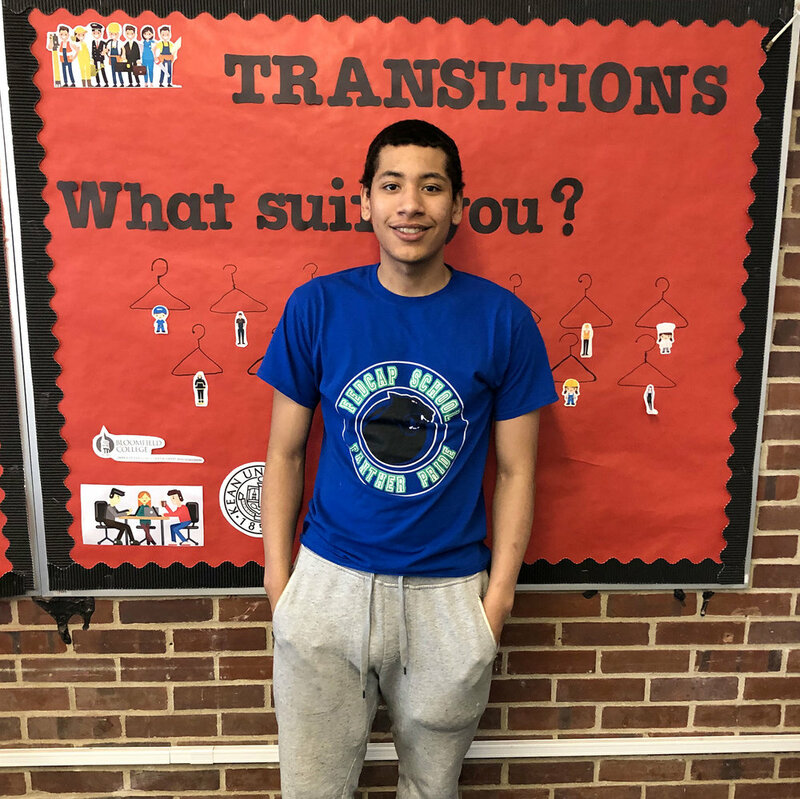 Eddie has also been trying to eat healthier because of his Diabetes so he’s particularly excited about the fruits and vegetables in the pantry, which are always a big help with his diet. Eddie can now enjoy his new home, and doesn’t need to worry about when life can return to normalcy. Because of supporters like you, we can provide neighbors like Eddie with vital resources and support every day and at the most critical times. While we can’t always prevent disasters from happening, you can count on our team to do everything in our power to make recovery easier on our clients. Thank you for making it possible. To support CUMAC's disaster relief program, consider donating new and gently used clothing, household items, and/or small furniture to our Community Closet.